In 1997, Japan was at the forefront of climate action. The birthplace of the Kyoto Protocol, an international agreement committing countries to limit greenhouse gas emissions, the country came to be synonymous with cutting carbon. Fast-forward 21 years and Japan has struggled to make significant progress on reducing its own emissions. Japan has a very limited supply of natural resources, so energy security dominates the political agenda, with climate change seen as the poor relation. With public concern over the safety of nuclear power following the 2011 Fukushima nuclear power plant accident still high, and renewables languishing at around 15% of the energy mix, Japan still depends largely on imported fossil fuels. The country seems hooked on coal. The share of coal in the electricity mix actually increased from 10% in 1990 to 31% in 2015. With ambitions to build around 40 new coal-fired power plants, on top of some 100 existing ones, it’s not surprising that fossil fuels still dominate energy plans. 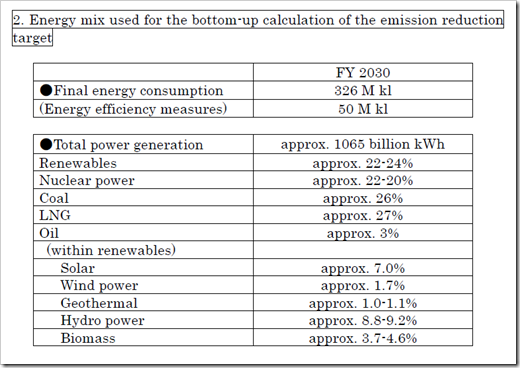 By 2030 the government envisages that fossil fuels will make up 56% of the Japanese energy mix — more than the nuclear (20-22%) and renewable (22-24%) capacity combined. What’s more, Japan has been slow to reduce emissions by enhancing the energy efficiency of domestic infrastructure. Homes in Japan are designed to be earthquake-proof and tend to be built with the humid summer weather in mind. As a result, buildings often have thin walls that provide minimal insulation, resulting in the overuse of air conditioning units both in the summer and in the winter. Taking all this into account, Japan’s contribution to meeting the goals of the Paris Agreement — a target to reduce its emissions by 26% by 2030, against a 2013 baseline — is considered unambitious on the international stage. The rest of her article is not worth reading – just the usual green whining. I am always stunned by how surprised these greenies are, when faced with the reality of their country’s INDCs at Paris. As I pointed out prior to Paris, Japan’s pledge only amounted to a cut in CO2 emissions of 10% from 1990 levels, much less than the EU’s commitment to cut by 40%. Worse still, the Japanese plan specifically aimed to increase the share of wind and solar to just 8.7% by 2030, a laughably pitiful amount. I may be doing young Michiyo a grave injustice, but should she not have been attacking her government’s plans three years ago? maybe a laggard but so be it. it’s a wonderful place with good people. They need to get all that nuclear back on line. The public concerns over nuclear are, thanks to green propaganda, misplaced – just as they are in the West. How many people were killed or injured by radiation from Fukushima? None, of course. …… As workers report cancers that could be linked to radiation exposure, it’s difficult to prove that the meltdown is definitely the cause. At least five applications for compensation have been denied, according to the Asahi Shimbun. Sadly one fatality in seven years. For perspective – in GB, deaths from using the stuff that Fukushima generated results in approx 18 deaths & 350,000 serious injuries each year. They have acknowledged (compensated) a few radiation linked cancers and a death, but yes, tiny numbers given the level of the fear. The comment about Japan’s energy being dependent on imports is noteworthy: the UK is now in the same situation unless we re-open a lot of coal mines or have great fracking successes. It is incredible that our energy security now depends on gas and electricity imports and the wind blowing all the time of course. If Groenigen is closed, as looks increasingly likely, The competition for Norwegian gas and hence its price will take-off, unless the Russians help! Maybe we need to re-visit the manufacture of gas from oil for security. I seem to remember that the Jap/US stand off that ended with Pearl Harbour was the result of Japan having few supplies of oil/raw materials, and needing to expand its sphere of influence into SE Asia. So, climate change may perversely be the cause of the next war as countries, like the UK, who have pursued foolish unreliable and unsustainable energy sources at the expense of their indigenous resource, in the name of climate change, panic. However, oil is likely to become abundant if all the electric cars happen worldwide.